Most planners first experience with event technology is the implementation of a registration and event check-in app. Event technology has however evolved tremendously in the past few years to make the lives of all event stakeholders easier, more engaging and productive. With that, selecting the right technology for conferences and events remains challenging for many planners. “Planners push the need for event technology, even though the technology they onboard may not be solving any issues,” shares Sarah Sebastian, Owner of Rose Gold Collective in Miami, Florida. “Before implementing any event technology, it is key for planners to understand what the objectives are. What problems need to be solved. What worked well for the previous event, and what needs to be accomplished this year. Who is the audience? Is the audience tech savvy, or do the participants need a more personal connection? Is the technology a tool to help the planner, or a tool for all stakeholders?” Sebastian shared. Attendee registration and event check-in. Attendee sign-up and event check-in is the entry to event technology for most planners. There is no longer a need to manage registrations with paper forms and Excel spreadsheets. Attendee registration can easily and securely be set-up online, resulting in the collection of accurate attendee data, and increased operational efficiencies. Most registration tools also offer seamless onsite check-in. We know programs change and emergencies occur; situations when planners need to reach a large percentage of attendees, making them aware of the change in plans or emergency. It is not efficient to post notes on boards, send email or make announcements. Now you can push out messaging to all your attendees simultaneously through apps and SMS, directly from your meeting management platform. There are great apps and platforms that invite attendees, speakers, sponsors and exhibitors to connect pre-, during and post-event, and create long-term relationships. You can easily gather contact information on the fly, communicate, schedule appointments and engage around program and content. Event technology invites you to create a richer engagement environment for your participants, and build influential communities around your cause, product, brand or company. When attending conferences and tradeshows we inevitably arrive home with a box full of business cards. You have to find the time to enter the data into your CRM or address book, and there is a good change you won’t remember the people you are adding to your contacts. With apps and other tools, you can now easily gather contact details by scanning badges. You can wear wristbands that via RIFD technology transfer data between participants, with information sent to the attendee via email. There is no longer a need to manually enter that shoebox full of business cards when you arrive home from the conference. Technology now exists to easily track traffic flow and allows planners to make decisions on the fly. Seeing how your attendees behave, you can move bars, coffee stations, and signage to steer attendees along a different path to more evenly distribute traffic flow. More sophisticated event tech tools can recognize attendee’s faces, read and analyze them. This can be used to securely check-in attendees at your event, speeding up the process and increasing security. Of great interest to your sponsors, exhibitors and speakers is Artificial Intelligence, the ability by apps to read your attendees’ emotions by evaluating facial expression, body temperature and movement. These technologies can assess level of excitement, if what you say is truly what you mean, track how long you stay in a both, how many times you return, immensely valuable information for any exhibitor or sponsor. According to Sebastian, consider tech if it makes sense for your organization, event and attendees. Don’t just employ event technology for the sake of it. What are the hot button issues you are trying to solve? What are the objectives of the meeting? Is it a networking opportunity or a conference with lots of sessions and a need to distribute content? Asking the right questions is key. What are the needs? Do attendees need an event app? Understanding the audience is imperative to the success of any event tech rollout. Is the audience a younger group, then yes, an app is expected. A mature audience may be less tech savvy and require a more one-on-one personal approach. However, it is key to not generalize the tech savviness of your attendees. Knowing your attendees is key. Read Top Tips for Meeting Planners on Engaging with Millennials. Your event app or technology is worthless if no one uses it. The most successful implementations keep in mind the attendee experience, and keep it as simple as possible. According to Sebastian, when looking for event tech, always think from the mindset of the attendee. What is their experience? Can you accomplish everything from one app, one platform? When implementing new technology, it may be key to provide resources to help your attendees, from onsite concierge support to a hotline or website to browse for help. Sebastian sees increased implementation of Artificial Intelligence in event technology. The ability to evaluate attendee behaviors, and translate that data to allow the planner, exhibitor, and sponsor to immediately adjust behaviors, locations, traffic flow and more. Artificial Intelligence is key to evaluate data collected on site immediately. You will see the further development of data collection and evaluation tools, according to Sebastian. 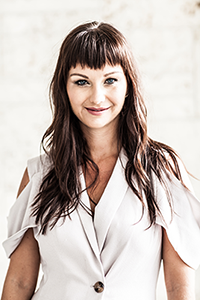 Sarah Sebastian has been in the event marketing industry for over 12 years working specifically with lifestyle and spirit brands from small startups to large brands. Now the Founder of Rose Gold Collective, she has a national presence as an event agency that strives to better connect brands to their core consumers through live engagements. Sales conferences, pop up shops, road shows, incentive trips are some of the event categories Rose Gold Collective produces. RGC infuses the latest technology to provide ROI for experiential events from design to execution globally. And please do us a little favor and share this post with others, for there’s a good chance that it will help them with their event tech search.